Universal Robots (UR), an industry-leading manufacturer of small to medium-size collaborative robot arms (cobots), have deployed more than 25,000 cobots in production environments around the world in key factory automation applications such as pick-and-place, quality inspection, packaging and palletizing. To implement quality and inspection applications successfully, the UR robot requires machine vision capability for vision-guidance, 3D scanning, measurement, and pass/fail control. Gocator 3D snapshot sensors are easily mounted onto the UR robot flange using a metal plate and connected to the sensor’s web interface from a client PC over an Ethernet connection, and add and configure the appropriate built-in measurement tools (e.g., Surface Plane, Surface Sphere, etc.) to return the required positional data. The sensor is connected to the robot controller or PC application to perform sensor hand-eye calibration, using the URCap plugin, to implement pick-and-place movement. The user does not have to write any robot programs or calibration routines and no expertise is necessary to set up the robotic systems for factory automation applications. Advanced user who require greater flexibility and control have the option of using the Gocator Development Kit (GDK) to develop and embed their own custom tools onto the sensor and the adapt calibration routine to their own calibration target. After a sufficient number of scans, the calibration is saved to the UR robot, and hand-eye calibration (between the sensor and the robot flange) is complete. After performing the hand-eye calibration, programming nodes are added in the UR robot’s interface to instruct the robot to connect to the sensor, load a job on the sensor, trigger a scan, and return positional measurements in the X, Y, and Z axes. 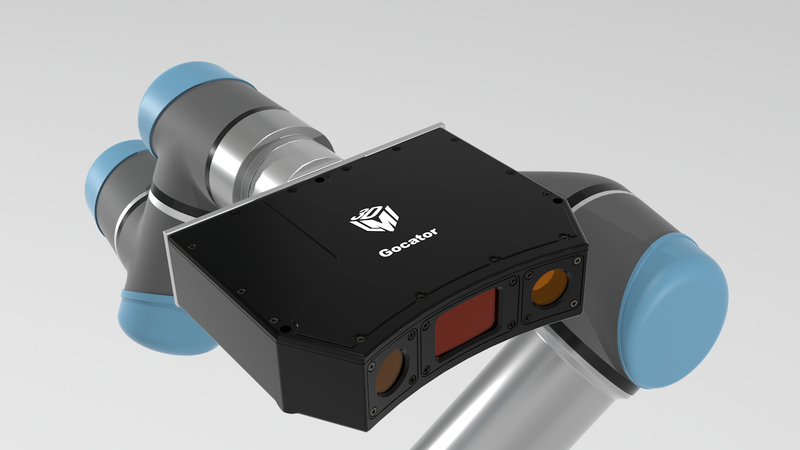 Gocator URCap provides a complete vision-guided robotic with minimal cost and development time.